(Brent and David originally wrote this piece for the Fall issue of The Feed, available here). With planning for 2017 underway, many are finding the tight budget environment is likely to persist in 2017. When evaluating the major row crops and major growing regions of the country, our crop budget estimates suggest that 2017 will be another challenging year for row crop producers. While there has been a significant amount of negative news about the 2016 economic situation, there were some positives. Perhaps the most important of these is costs of production declines. This year saw some reductions in fertilizer and fuel prices, as well as, cash rents. Unfortunately, higher crop prices and additional cost reductions will likely be necessary to restore profitability in 2017. In terms of crop yields, 2016 is the third year in a row that U.S. producers have harvested very large corn, soybean, and wheat crops. These large crops have put tremendous downward pressure on crop prices. There is perhaps no better illustration of this situation than the wheat market where producers throughout the Great Plains were seeing cash prices well below $3.00 per bushel. The low crop prices have put farmer profit margins into negative territory. In many areas of the country output prices are well below the total economic costs of production. We track how output prices compare to variable costs of production plus land rents. In most cases output prices are not sufficient to cover variable costs (such as seed, fertilizer, and fuel) and land rents, let alone machinery costs and unpaid operator labor. This means that there will continue to be pressure for costs to adjust downward. This is particularly true for wheat production in the Great Plains. One of the biggest causes of the economic downturn is that farmers around the world greatly expanded acreage during the farm boom. This can be seen in Figure 1 which shows world principle crop acres from 1950-2016. There are a few important things to note about this graphic. First, when acres come into production, they rarely leave. You can see the large increase of the 1970’s and early 1980’s which was brought on by a previous agricultural boom. 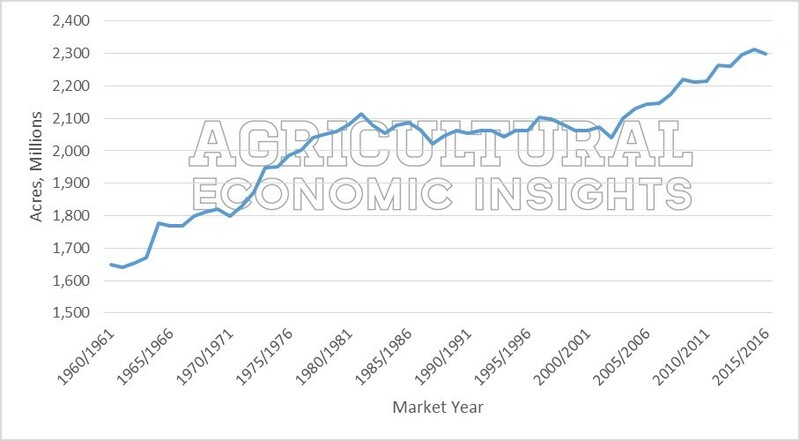 When incomes fell in the 1980’s, acreage did not contract back to pre-boom levels, rather they stayed relatively flat until the next boom period of the mid-2000’s. Since 2000 the world’s farmers have added significant amounts of cropland. For example, from 2000 to 2015 South American farmers added approximately 86 million acres of cropland. This is a large amount, roughly equal to the acreage of soybeans that were grown in the U.S. in 2015. These large acreage increases are likely to influence the economics of agricultural production for a long period of time. Combining large U.S. crop and an increase in global acres, the conversation has switched from “too little production” to “burdensome levels of global grain inventories” in just a matter of a few years. Furthermore, it’s important to note that below average yields – as traders feared in June of this year –alone not enough to create a multiple year surge in commodity prices and farmer income. Such a situation would require a demand-driven shock. All of the additional acreage means that it is critically important that we cultivate strong demand for agricultural commodities. This means everything from biofuels, to livestock, to emerging markets, to alternative bio products. This will be particularly important because government program payments will start to decline quickly in coming years. For instance, we would expect producers in the Corn Belt to receive payments in the neighborhood of $30 per acre for the 2016 crop (which will be received in 2017) to less than $10 per acre for the crop planted in 2017 (and paid in 2018). This dramatic drop-off will mean that budgets will have to change. The negative margins being experienced in farm country will put pressure on all costs. This means that land rents, land values, and capital investment in agriculture will continue to face downward pressure. To date, the largest adjustments have come from changes in cash rent and fertilizer prices. For example, we observed earlier in the year that budgeted production costs for corn production in the Corn Belt was $61 per acre lower than the previous year. The largest source of cost reduction, 52% of the total, was a result of lower fertilizer prices. Looking ahead, pressure on other inputs, and particular, land values and cash rents, will be likely. In short, it is important that farmers carefully manage their costs or production and their financial situation in the coming years. Estimating ARC-CO payments is difficult because they depend on county level yields which will vary considerably throughout the region. Further, payments are made on base acres rather than planted acres and these amounts can diverge considerably. Some counties will have much higher payment rates, but when payments are adjusted to base acreages and county yields and then factored across all acres of corn production they will likely be well below the stated payment rates.